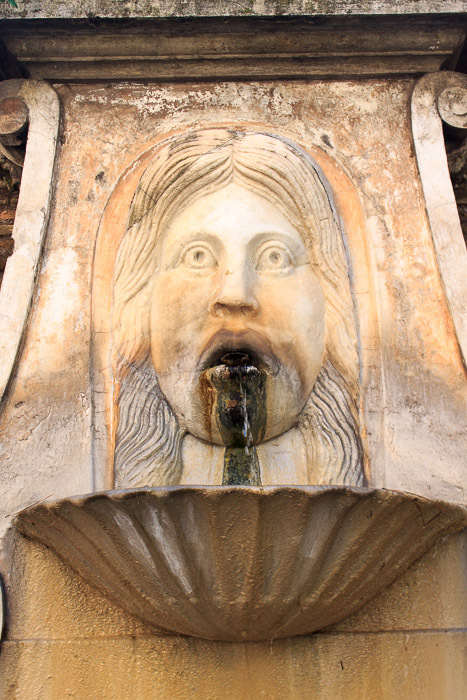 The Fountain of the Mask, or Mascherone di via Giulia (via Giulia's grotesque face) is a wall fountain behind the Palazzo Farnese on Via Giulia, a north-south street near the Tiber River across from Trastevere. Although this street is now quiet and forgotten, when the fountain was built it was a main street and the most elegant road in the city. 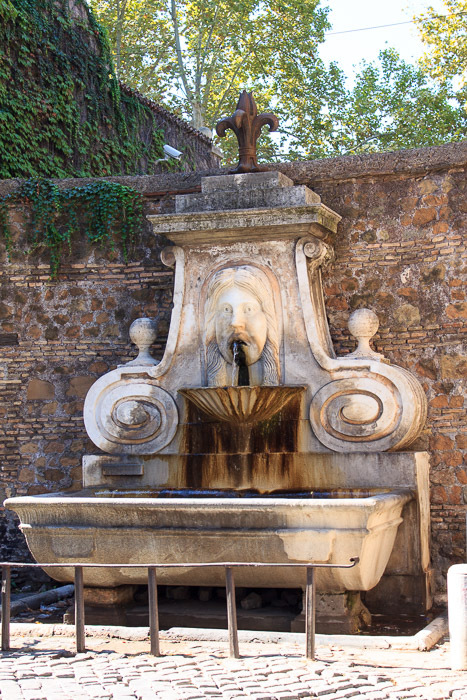 The fountain was commissioned by the Farnese family, and was built in 1626 by reusing ancient Roman artifacts. The enormous central white marble mask has been dated back to the ancient Romans. 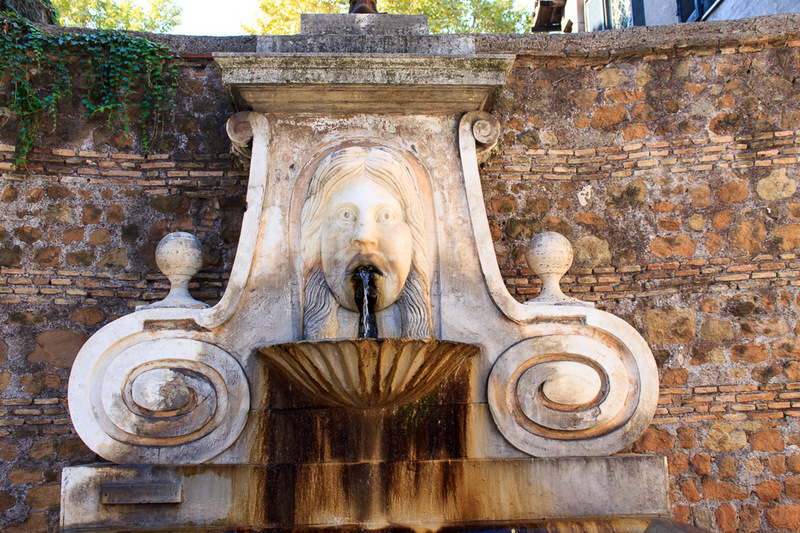 Water spurts from the face's half-open mouth into a small seashell-like basin mounted to the wall below it, then down to into an ancient porphyry trough, also from ancient Rome . On either side of the face are large marble scrolls which support a fleur de lys at the top, which is the emblem of the Farnese family. 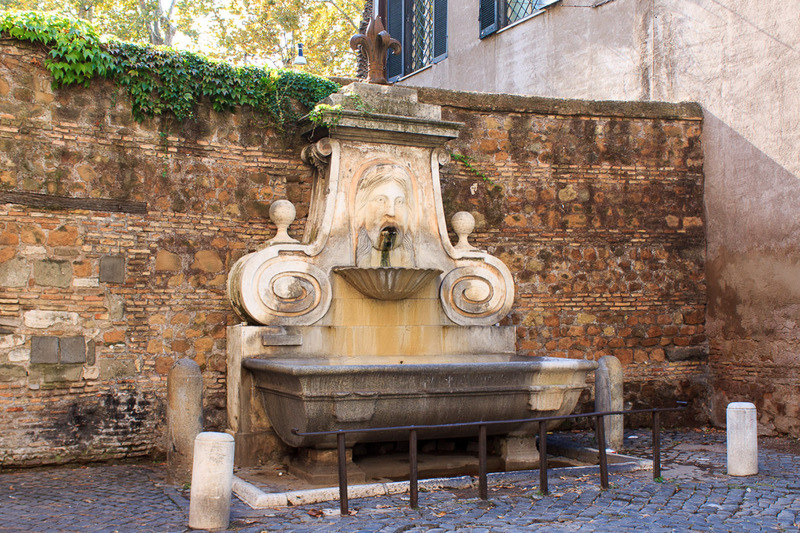 On special holidays, wine ran from the fountain rather than water, thanks to the generosity of the Farnese family, similar to the way wine ran from the Capitoline Egyptian Lion Fountains. The fountain was apparently cleaned sometime between September 25, 2013 (1st two photos below) and October 3, 2014 (last two photos below), and it looks much nicer; thanks to whoever is reponsible for that. The Farnese Arch is very nearby. See all Fountain of the Mask photos.